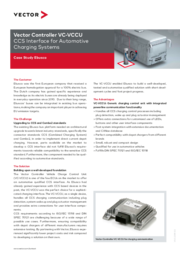 The Vector Controller Vehicle Charge Control Unit (VC-VCCU) is one of the few ECUs on the market to offer an automotive qualified Combined Charging System (CCS) interface. As Ebusco had already gained experience with CCS based devices in the past, the VC-VCCU was the perfect choice for a sophisticated charging interface. The VC-VCCU, as a single device, handles all CCS charging communication including plug detection, system wake up and plug actuator management and provides extra connections for user interface components. 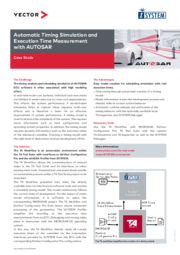 The Challenge: The timing analysis and scheduling simulation of AUTOSAR ECU software is often associated with high modeling effort. The Solution: The TA Workflow is an automation environment within the TA Tool Suite with interfaces to DaVinci Configurator Pro and the winIDEA Profiler from iSYSTEM. The Advantages: Easy model creation for scheduling simulation with real execution times. Working with its services partner CRITICAL Software, the Vector Global Services team put together a Project Management Plan (PMP) during the first week of engagement. A PMP establishes the working relationship, objectives, communication protocols, status reporting and detailed completion criteria, so that each project maximizes success probability as defined by Moore. The PMP also ensures Vector has a good arrangement with any providers or partners, such as CRITICAL Software, who also follow the same PMP. Working with its services partner CRITICAL Software, the Vector Software Global Services team put together a Project Management Plan (PMP) during the first week of engagement. A PMP establishes the working relationship, objectives, communication protocols, status reporting and detailed completion criteria, so that each project maximizes success probability as defined by Moore. The PMP also ensures Vector Software has a good arrangement with any providers or partners, such as CRITICAL Software, who also follow the same PMP. 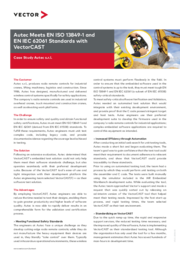 AEL needed a solution that was easy to use, flexible, and reliable. After a rigorous two-month trial, AEL selected VectorCAST. As part of their evaluation process, AEL performed code coverage on over 250 files and 800 functions, totaling 20,000 lines of source code. 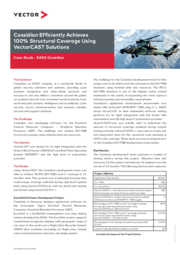 With VectorCAST, a single engineer working for 150 hours was able to achieve 85% code coverage. 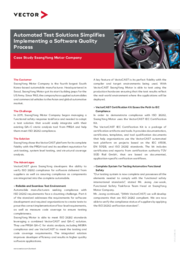 Following an extensive evaluation, Autec determined that VectorCAST's embedded test solution could not only help them meet their software standards challenge, but also operates seamlessly with their preferred development suite. 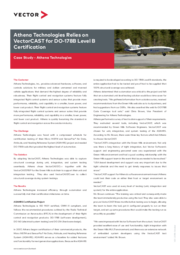 Because of the VectorCAST tool's ease-of-use and tight integration with their development platform the Autec engineering team selected VectorCAST/C++ as their software test solution. By adopting VectorCAST, Athena Technologies was able to capture structural coverage during unit, integration, and system testing seamlessly. Athena chose VectorCAST/C++ together with the VectorCAST/RSP for the Green Hills tool chain to support their unit and integration testing. They also used VectorCAST/Cover to collect structural coverage during system testings. 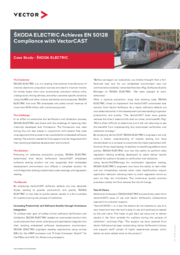 Following an extensive evaluation process, ŠKODA ELECTRIC determined that Vector Software’s VectorCAST embedded software testing solution not only supported their embedded development environment, but offered a complete solution for unit/integration testing, system test, code coverage, and regression testing. SsangYong chose the VectorCAST platform for its complete fidelity with the PRQA tool and its excellent reputation for unit testing, system level testing, and structural coverage analysis. VectorCAST was chosen for its tight integration with the Green Hills Software's IDE MULTI and Real-Time Operating System INTEGRITY and the high level of automation provided.